The Republic of Kenya, located in the Eastern Africa, stretching across the equator, owns about 582 646 square kilometers area of land in total and more than 600km long coastline that is rich in fish species bordering on the Indian Ocean. Kenya is abundant in fishery resources, and most of fishery resources come from the cisborder lakes, especially from the world’s second largest freshwater lake but the largest lake in Africa – Lake Victoria with productive ecosystems and fish diversity, whose fishing yield accounts for about 90% of total production quantity of fishery industry. According to the statics from FAO(Food and Agriculture Organization of the United Nations), in the year of 2013, Kenya’s fish farming and fishery industry accounted for about 0.54% to Kenya GDP(Gross Domestic Product) and made positive contribution to solve the employment and livelihood problems of about 129 thousand Kenyan, thereinto there were about 67 thousand in farmed fish field and around 48 thousand in freshwater lake fishery. In Kenyan waters, fish species are really plentiful and can be sorted into pelagic fishes(such as tunny, barracuda and sailfish, etc. ), demersal species(like bream, sturgeon, parrot fish, etc. ), invertebrates and shellfish(shrimp and live fresh water crabs, for example), molluscs(for instance, octopus and sleeve-fish) and so on. With high-quality seed supply, Kenya’s farmed fish yields came to above 23 thousand metric tons in 2013, which is over 4times of the yields before five years. In 2012, the export value of fish almost reached up to 63 million dollars, around five times of the importing fish value(less than 13 million dollars) in the same year. However, from the FAO report, Kenya’s export value of fish and aquaculture products declined sharply in 2014 while its import value kept raising gradually. In recent years, Kenyan government and owners of fishery have been committed to increasing their exporting volume and farmed fish production for more profits, especially since the administrative vice minister of Kenya’s Department of Fisheries said that Kenya had already got the permission from EU to export cultured fishes in 2015, erenow Kenya mainly exported fishes from natural waters that couldn’t keep good situation because of over-fishing. Statistically, half fishes consumed by global people were cultured fishes and others were fishes from natural water bodies, while the cultured fish quantity of Kenya only held 24 percents of total. Drawing from the data of Kenya’s government, the gross volume of fishes exporting in 2014 was 150 thousand tons, and the aquaculture production was just 46 thousand tons in the corresponding period. Compared with relatively developed countries, the fish feed industry in Kenya is still immature with backward fish feed producing technique, outdated equipment and low-efficiency management, which is insufficient for the ever-increasing demand of farmed fish industry. Essentially, the higher cost of fish feed is one of the obstacles for fishery better development, and fortunately Kenya’s government and its fishery owners have realized it and been trying their best to reduce the cost. It has been found that exporting the cheaper fish feed production plant is an excellent choice. In a Chinese old saying “To do a good job, you must first sharpen your tools”, in order to develop better fishery, especially farmed fishing industry, Kenya should promote the production and management technology of fish feeding stuff, and improve the level of fish feed production machines. At this point, FANWAY fish feed machinery, a leading professional fish feed pellet line designer and manufacturer, can provide the customized high-performance fish feed making machines according to customers’ different requirements, aiming at decreasing the feed waste and cost, and maximizing fish yield and profits. Through years’ of research and practice, FANWAY has launched the most suitable fish feed making machine for Kenya fishermen – wet type fish feed extruder and dry type fish feed extruder. As we all know, fish needs diverse nutrition supplies in various growing periods, but good-quality fish feed in the market always requires higher price and sometimes fish food has crude protein that is hard for fish to digest, all of which makes it a big case for fishermen especially for the fish farmers to choose suitable feed at lower cost. Therefore, lots of fishermen decide to produce the floating or sinking fish feed by themselves via using wet or dry type fish feed extruder. 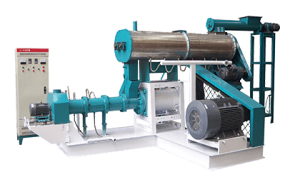 Usually, for small and medium size fish-farms, FANWAY suggests to choose the dry-type fish feed pellet extruder because without steam generator for heating, dry fish feed extruder is much cheaper than the wet one. Although the wet type fish feed extruder seems relatively expensive, it can eliminate the salmonella disease and microbial bacterial infections by high temperature and pressure treatment and the ripening and mixing of raw materials in the conditioner, which makes the produced fish feed more easily to digest and absorb. 1. This fish feed making machine, made from alloy steel, has the stable structure, lower noise, small occupation and easy operation, all of which makes it popular among farmed fish industry. 2. For dry type fish feed making machine, there is no need to add additional water into machine, so pellet fish feed from dry type extruder is more convenient for storage. 3. High temperature and pressure processing of machine can promote the immunity and prevent the diarrhea disease by killing bacterium and improving the fish feed hardness, which also extends the fish feed pellet floating time. 4. Adopting the advanced technique and scientific design, fish feed making machine has high efficiency, super performance, long lifespan and low consumption. Moreover, feed machine can also be applied to produce economical pellet feed for other animals, like rabbits, ducks and so on. 5. 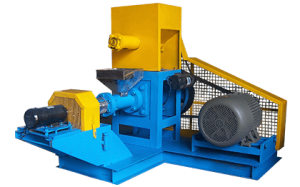 Fish feed pellet extruder supports raw materials with ample mixing during the process so as to fully intake the nutrition without waste even in the hot and moist season, the pellet feed will not get soured after long-time placing. During the running process of machine, please keep away from the feed inlet, and FANWAY suggests to add the raw materials via using a stick instead of hands. Please make sure the raw materials added before starting the fish feed pellet extruder. Moreover, remember to leave some materials in the machine when stopping work, avoiding the unnecessary losses caused by rollers directly touching the die mold. 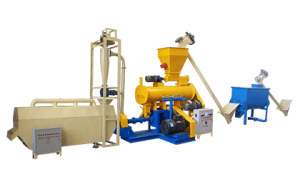 Once the machine gets stuck, users should turn off the fish feed pellet extruder immediately. The bolt of express rollers should be loosened after work finished. Regularly check the extent of machine’s belt tightness to prevent belt slipping, and change the lubricating oil for machine, which can expand the service life of machine. Please don’t worry if the temperature of engine rises to seventy degrees after a long consecutive running. That is normal phenomenon.